Saudi Arabia's interior minister has accepted undisclosed damages over an article in The Independent newspaper accusing him of ordering police to shoot and kill unarmed protesters. The newspaper accepted the "order" it reported was in fact a fake. Its publishers, Independent Print Ltd, also offered "sincere apologies" to Prince Nayef Bin Abdul-Aziz al-Saud at London's High Court. 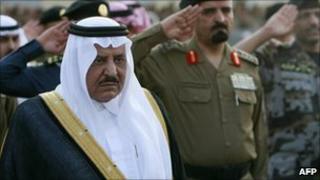 Prince Nayef has said he will give the "substantial" damages to charity. The article was written by the Independent's Middle East correspondent Robert Fisk, who also offered his apologies, and published on 15 April. Rupert Earle, appearing for the prince, told Mrs Justice Nicola Davies the untruthful allegations arose after Saudi Shia activists sought to organise a demonstration on 11 March. It was described as the "Hunayn Revolution" after a battle fought by the Prophet Muhammed in 630 AD. Several websites featured an order allegedly issued by Prince Nayef, who is second in line to the Saudi throne, and addressed to police chiefs before the demonstration. It stated that Hunayn demonstrators "should be shown no mercy, should be struck with iron fists, and that it was permitted for all officers and personnel to use live rounds," said Mr Earle. The alleged order ended with Prince Nayef wishing the police luck. On 15 April, the Independent published a feature headlined "A long time coming", in which Mr Fisk gave his account of the so-called Arab Spring, a series of revolts in the Arab world. The article was reproduced on the newspaper's website entitled: "The Arab awakening began not in Tunisia this year, but in Lebanon in 2005." In the article Mr Fisk said The Independent was in possession of the "extraordinary and outrageous" order from Prince Nayef and said it was "worthy of investigation by the International Criminal Court at The Hague". The allegation was not put to Prince Nayef, who is also second deputy prime minister and has been interior minister for more than 40 years, before publication, said Mr Earle. It was reproduced in its entirety on various websites and paraphrased in numerous news stories published by leading Arabic language media, he said. "In fact the 'order' was a fake and bore numerous features which any genuine orders issued by the Saudi Minister of the Interior would not bear," said Mr Earle. He told the judge: "The defendants now accept that there is no truth in the allegation that the claimant had issued an order to police chiefs throughout Saudi Arabia to shoot and kill unarmed demonstrators without mercy, or that he therefore deserves to be investigated by the International Criminal Court for a crime against humanity." Helen Morris, solicitor for The Independent, told the judge the newspaper's publishers, Independent Print Ltd, and Mr Fisk accepted there was no truth in the allegation and withdrew it "unreservedly". "The decision to refer to the order was made in good faith, albeit in the mistaken belief that the order was genuine," she said. "Both the Independent and Robert Fisk offer their sincere apologies to Prince Nayef for the damage and distress caused by the article and the inevitable coverage it received."